With the truck out of service for a bit, some chores just have to get done such as hauling the household trash. I had done this last week as well but neglected to take a picture. See how easily a trash can fits in the sidecar? It. obviously, takes multiple trips to get the same job done but it's easier than trying to do it with the car. The 25 watt silicone pad that I'm going to be installing under the Ural battery came in this week from Amazon. That will be an easy afternoon project. The weather around here made a brief foray down to -20°F last night (so I'm told) but it had warmed up again to -6°F by mid-morning. 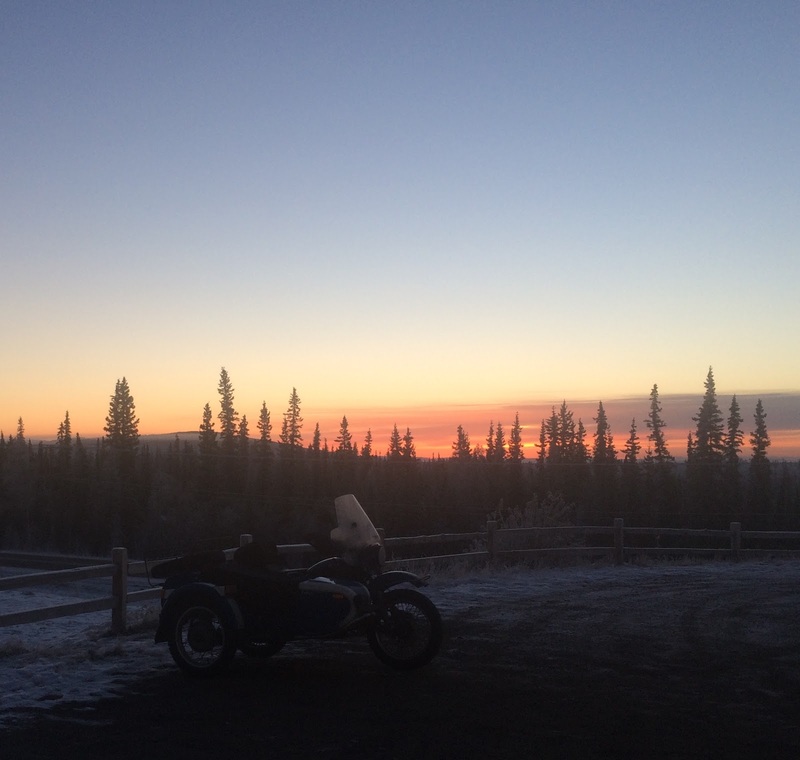 Ran a couple of errands this afternoon on the Ural and it is still running great. It seems to like cold temperatures. My attempts to start the truck eventually succeeded after 2 quarts of Diesel 9-1-1 fuel supplement and replacing the fuel filter. The original filter had a lot of wax caked on it. Hopefully, sitting in a warm garage will allow the fuel to re-liquefy and let the anti-gelling additive to do its job. This seemed to be the weekend when things decided to stop working. Besides the truck, the Kitchen Aid mixer decided to stop working (micro-switch needed cleaning) and the kitchen faucet ended up needing to be replaced. I liked the way the new faucet looks and it works better than the old one where the hose pulls out. I'm glad that we didn't have anyone over to celebrate Thanksgiving. It would have been more stressful when things stop working. Just a quick post to try out the camera on the replacement Nexus 4. The original phone has a broken microphone which makes it less than useful as a phone. It has a Barrow number to allow it to be reached from the toll restricted VoIP phones in the BARC. The replacement was ordered on Friday afternoon from Amazon and it arrived on Monday using "Standard Shipping". Impressive. The new phone had to go through a long update process as it came with Android 4.4.2 installed and now has 5.0 aka "Lolipop". I like the Nexus line of phones as it has the true "Google Experience" without all of the junk software that cell carriers install on their Android products. Plus, Google controls the software update process not the carrier. It is also is carrier unlocked. As you may notice in the snapshot, we have not received any additional snow. The roads have a thick layer of frost this morning left from the warm, foggy night. 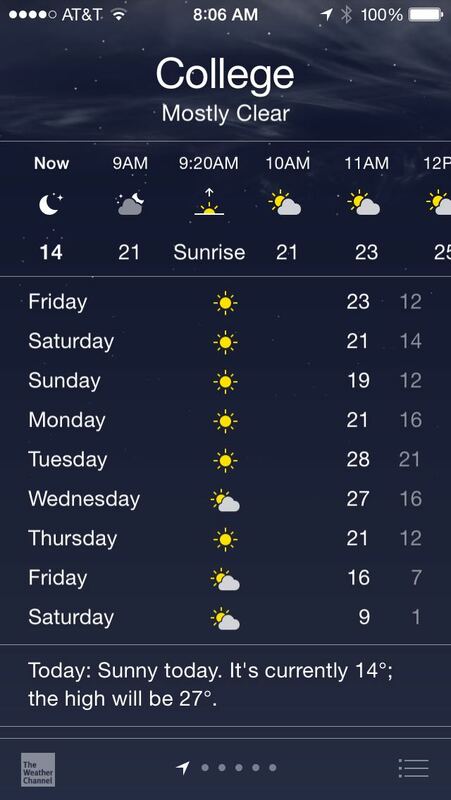 Hopefully, it won't get too much warmer. Last year we had rain the week before Thanksgiving and it pretty much shut down Fairbanks. Rain on top of cold roads made a thick layer of ice that hung around all winter. The camera is supposedly 8 megapixels the same as the iPhone 5s but the pictures don't seem as sharp. I still haven't found a convenient way to transfer pictures from Android to the Mac or iPad nor have I found a decent blog posting app. Any suggestions? Another beautiful morning. This is around 9:00am on Sunday morning which is about 40 minutes before sunrise. 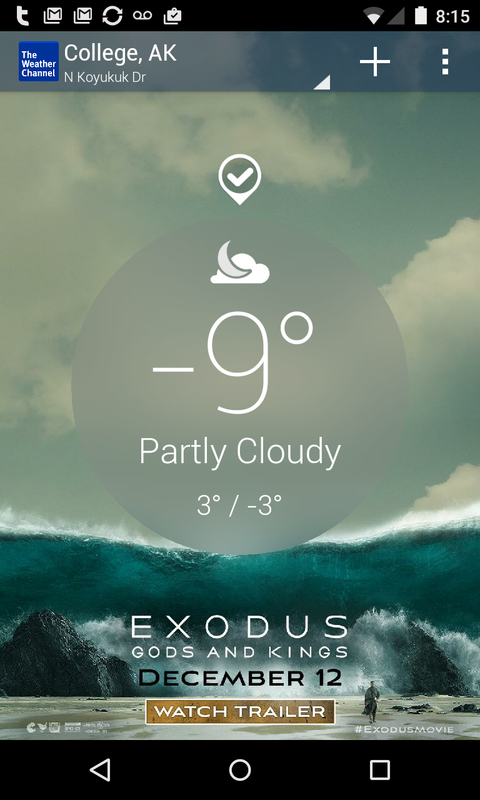 At -5°F, it's a bit cooler than was originally forecast. Lot of errands that needed to be run as I am in the process of installing a new dishwasher. The original builder must have not been sure where the dishwasher and sink were going to be installed as the hot water supply line for the dishwasher and the cold water for the sink came through the floor underneath the dishwasher. The new dishwasher has no room for such things. But after an afternoon of playing amateur plumber, the pipes are all rerouted. 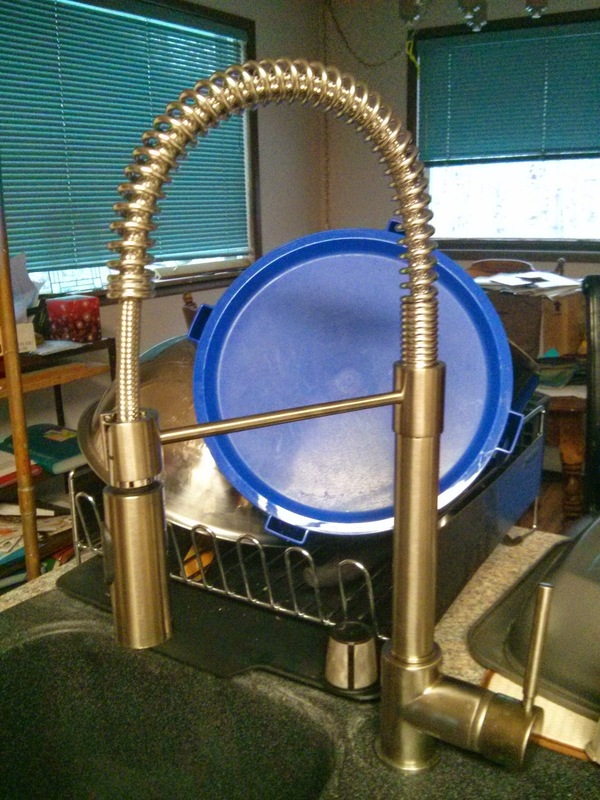 I still need to run a new hot water line for the dishwasher, maybe later today. 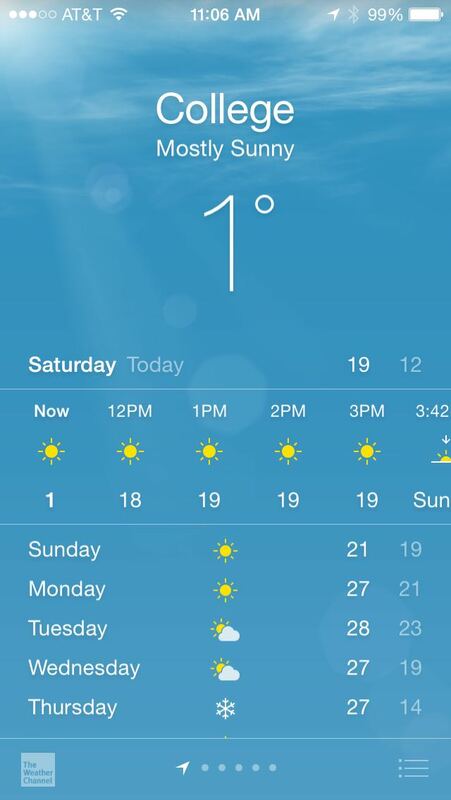 The Apple iOS app, by the way, also claims to use the Weather Channel indicated by the logo on the lower left. The university temperature sign claimed -4°F at about 10am. A few comments about Android. I had not even powered on the Nexus 4 since it was returned to me at the end of the summer field season. After charging, it updated itself from 4.4.2 to 4.4.3 to 4.4.4 to 5.0. I thought that the iPhone went through a lot of updates. The only problem with the phone is that it doesn't work well as a phone due to a non-working microphone. I think I heard that it went on a short trip through a washing machine a couple of summers ago. The tech last summer used it with a Bluetooth headset. I think I'm just going to replace it as the price of the unlocked phone on Amazon has dropped considerably since the Nexus 4 had first came out. And there are no 4G data services in Barrow. BTW, Android 5.0 aka "Lolipop", is pretty nice. Almost nice enough to convince one to switch from iOS. But battery life still seems to be lacking. 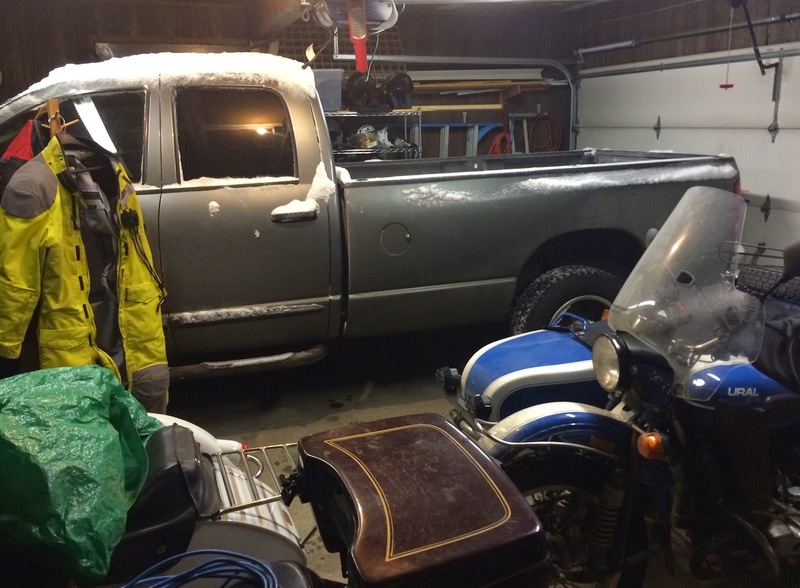 Inspired by Steve Williams of Scooter in the Sticks, post about how much hassle it was to get ready to ride in colder weather. This morning, I timed the ritual of getting ready. I think the key difference is the use of the heated liner. Instant heat, no layering needed and the glove wiring is built in. The collar of the heated liner is tall enough and is also heated so my neck is toasty warm. I've never needed a balaclava. If it's below -10°F, I'll add a fleece liner over the heated liner. 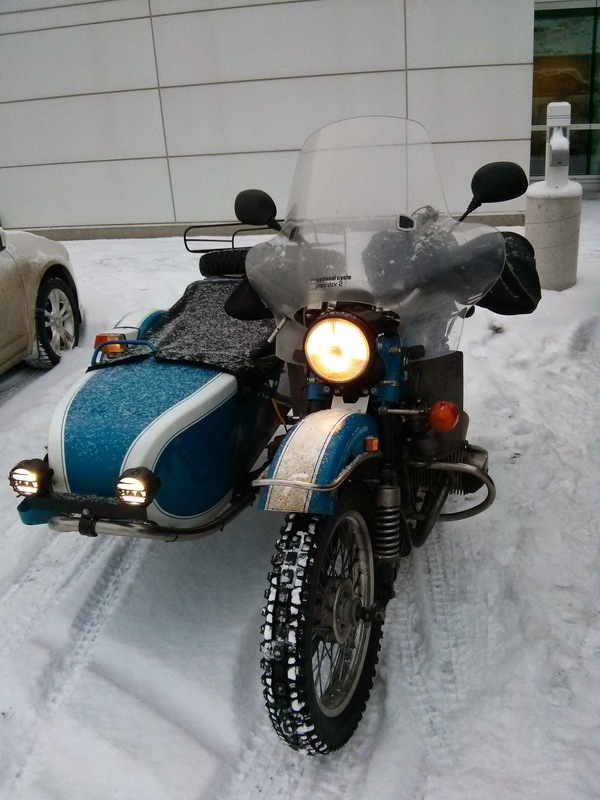 We'll see how well this works this year as I feel the cold more on the Ural than on the Beemer. If I'm just going on a short ride, I'll usually dispense with the heated gear and Roadcrafter and just wear a riding jacket such as my old Kilimanjaro or a denim riding jacket over a fleece liner and insulated gloves. Not due to time but more hassle dealing with the bulk of the Roadcrafter when I reach my destination. Carhartt lined jeans are worn for most of the winter and they seem to do a good job of blocking the wind. It looks like we have a great week coming up (weather wise) with clear or mostly clear weather and relatively moderate temperatures. Unlike some other areas of the country, folks here are praying for snow. Without the insulating layer of snow, water and sewer pipes may freeze. I think that we are in good shape as our pipes don't pass under any area where the ground would get compacted. Compacted ground is a better heat (or cold) conductor. I know that I mention this every year but I still find it interesting. 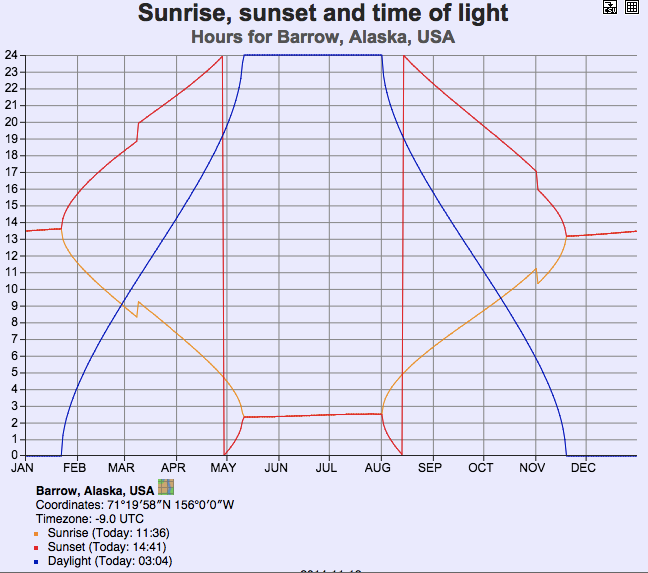 The last appearance of the sun this year in Barrow, AK, is less than a week away. Wednesday, November 19, 2014, will be the last sunrise/sunset until near the end of January. 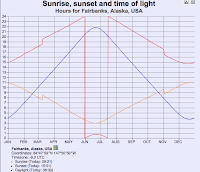 Daylight hours is shown on the blue line on the graph. Sunrise is yellow and sunset is red. The two lines converge in November. 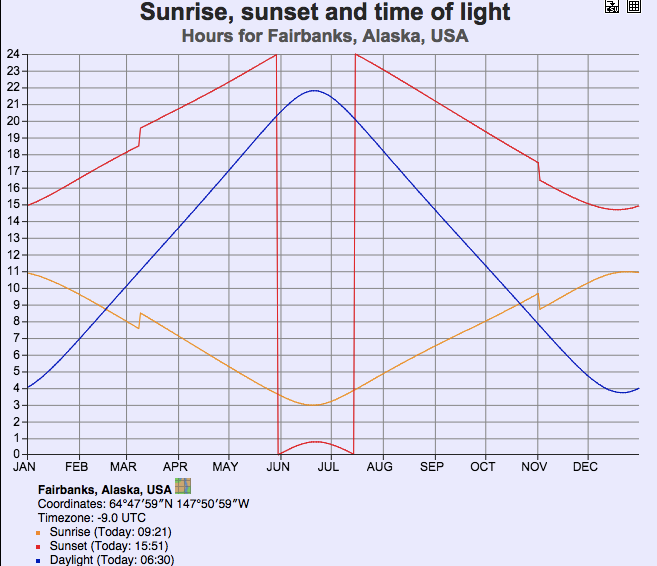 The graph for Fairbanks isn't as interesting. On the shortest day of the year, we still have almost four hours of sunshine. The only moto-mod that I've done to the Ural over the last couple of days has been the addition of a relay mounted above the battery that switches on with the ignition and provides switched power for the heated grips and heated gear. There has been a couple of times when I found that I had left the heated grips on for an hour or so. No problem starting the engine but I figured that one of these days I'll come back to a dead battery. Many choose to run the heated grips through the ignition switch but I figured that the switch didn't need the additional current. Since the relay will handle 30 amps I could also move the sidecar power to the same relay or add an additional relay later. The seat mounting plate above the battery has a lot of space for things like relays. The stock starter relays are mounted there already. There is no cold temperature oil recommendation in the Ural manual, at least not that I can find. The airhead owners manual (pictured on the left) has oil recommendations down to -20°F I figured that the BMW recommendation is probably close enough. Now that winter is sort of here, I finally got around to changing the Ural engine oil from the normal 20w50 to something a little more winter friendly. Looking around the garage, there was a 5 qt bottle of 10w40 dino oil. I would have preferred a synthetic blend but since this was handy, it seemed like a reasonable option for the next couple of months. 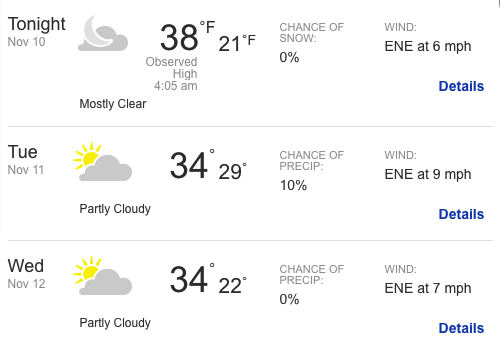 I don't really plan on riding much below -20°F anyway. I'll change the transmission oil and do the rest of the maintenance at the 22,500km mark. There was evidence of moisture in the engine oil so maybe I need to take the scenic route more often to burn off the moisture. I drained the aluminum crankcase vent canister again and there was almost a cup of water and a little bit of oil. It needs to be emptied with every tank of gas. It was -4°F this morning and the newly repaired Gerbings heated liner and gloves felt pretty nice. I had forgotten that there's heat along each finger and thumb. Today, I also made a slight modification to the Arctic Cat handlebar muffs and sewed a buttonhole for the mirror stalk to run through. I installed the 50 watt silicone pad heater that I had initially picked up for the airhead battery. There wasn't enough flat area on the oil pan so I attached it to the left side of the engine just above the oil pan. A bit of heat should help the engine turn over when it really gets cold. This afternoon, someone commented about the cord hanging out the back of the bike. Like many other moto-bloggers, I was contacted by a representative of Motorcycle House to review an item from their current catalog. The initial request was for a guest post and that I declined. I was skeptical of followup inquiries since they came from a Gmail account rather than a company email address. But that issue was resolved. The only lingering issue was that there seemed to be quite a few customer service issues in some forums but most of those rants weren't very recent. I had originally asked about battery powered heated gloves but was told that they were not available for review at that time and was asked to look for something in the Viking bag line. The Viking Sport Tailbag (AXE-23) was one of the few items that would work on the Ural. When I wrote back, I was told that they were out of stock and could I pick something else. I mentioned that there really weren't many things on their site that would fit on a Ural as most of their inventory seems to be targeted at the cruiser market. 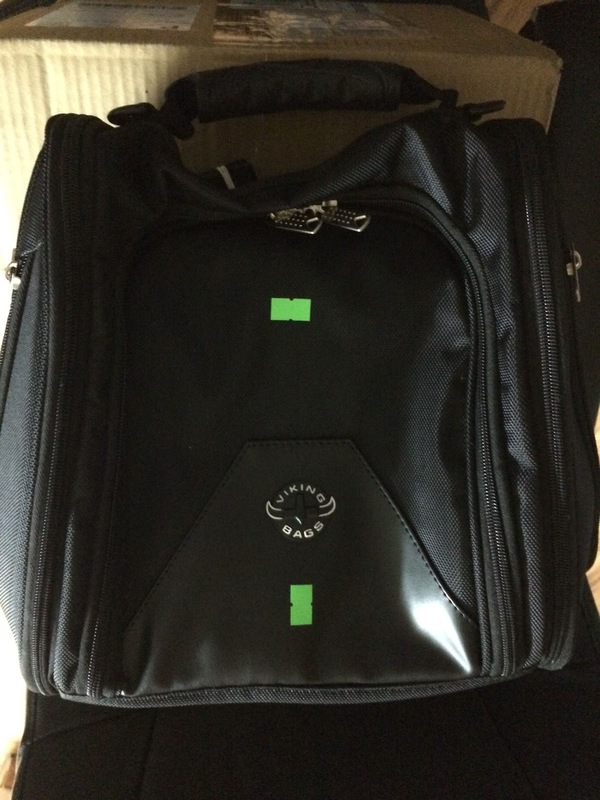 Now that I received it, I believe that it is the same bag that Doug reviewed in September. On the airhead, I used a tank bag to haul things back and forth to work every day but over the last seven years it has made a real mess of the tank (lots of scratches in the paint mostly on the sides where the magnets stick). Plus, it was too small to fit a laptop or even an iPad. This bag seemed like it would be large enough to haul what I need on a daily basis, fits the Ural and includes a shoulder strap and a waterproof cover (I won't need that for a while!). The sides of this tail bag expand an additional couple of inches or so on each side when needed or they can be collapsed with a zipper. The bag easily holds my 11" MacBook Air, Chromebook or Lenovo Helix inside of a protective sleeve, the iPad, winter hat and gloves and still has room for lunch and snacks. I did try an older 15" Macbook Pro and it would only fit without the sleeve. Less than optimal. All seams are covered with bias tape so there are no raw edges showing. This should add to the life of the product. There are side pockets though I'm not sure what I would use them for as there is a stiffener on the outside to help the bag keep it's shape but it makes it difficult to fit anything in them. The zippered pockets on the inside of the top flap would be useful for receipts, pens and such. The only thing that I would add on the inside is some sort of D-ring or clip for keys. Unlike most tank bags, there is no pocket for holding a phone and there is no provision for a power feed. Something that would be easy to add. The tail bag simply sits on the seat and the built-in bungee cords hold it in place. The passenger grab handles make for an obvious place for the bungee hooks though, for me, the bungee cord mounting is a weak point. Usually, when bungee cords get really cold, they tend to lose their elasticity. I will probably be replacing them with some sort of clip and strap setup in the near future. It only takes a few seconds to mount or dismount the bag from the seat. That could be good or bad depending on your perspective. I don't think I will use it for anything heavier such as camera gear until I can switch out the bungee cords for a more positive strap. The tail bag isn't as convenient as the top box on the Beemer for throwing junk into but I like it better than the tank bag. It is big enough without being overly large and bulky and has the convenient carrying handle. 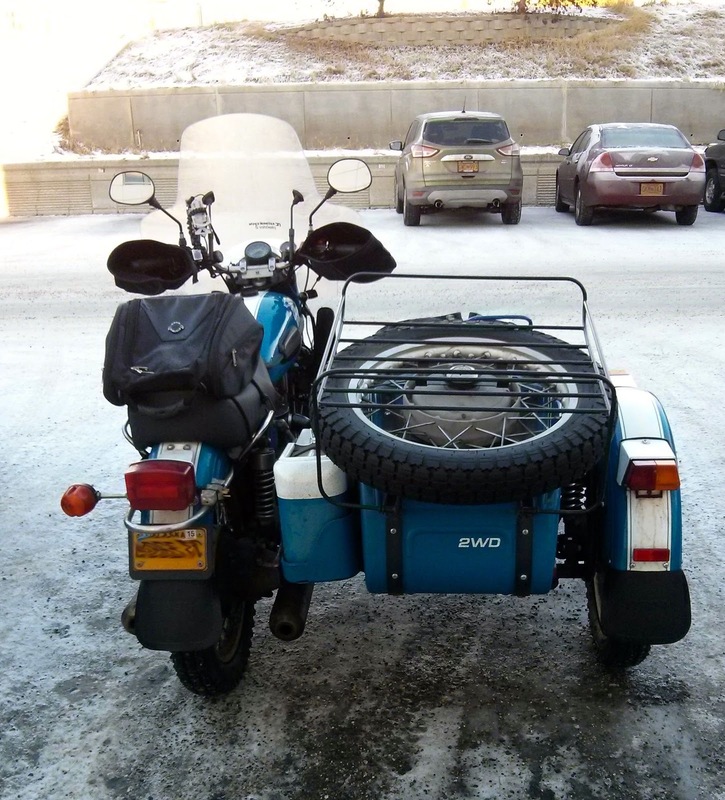 The Ural does have lockable storage in the sidecar but this is much more convenient for the daily running around that I tend to do especially in the winter. For long trips, I'm thinking that the shape and size may be a good fit for the front of the sidecar. Maybe on top of a front rack that some Ural dealers sell as an accessory. Overall, I'm satisfied with the construction and utility of the tail bag and I foresee it getting a lot of use. Especially for commuting. Another beautiful morning. It's still around an hour before sunrise, but it's still dark for my commute to the university. Much warmer today at +9°F compared to yesterdays -9°F. The repaired heated gear from Gerbings has still not arrived. I guess it's being shipped on the very slow version of FedEx. A week after the tracking info was sent to me, all the FedEx site says is "Label created". I believe that this is more Gerbings than FedEx as it took them almost two weeks after they received the items to even call and acknowledge that they were doing anything. I had also tried an HDR version at the same time as the first picture but I don't really care for the color of the sky. Not very realistic and since two pictures are taken, there's a little more blur. Thursday Evening Update - Gerbings told me on the phone that they ship FedEx or UPS and the tracking number they sent was a FedEx number. The package arrived today via USPS priority mail. I guess they tried FedEx and balked at the shipping cost and looked for another option. USPS priority is a great option when shipping to Alaska. So I shouldn't have given them flack earlier in the post. Just a quick post if for no other reason than to document for myself that I am in Anchorage. I am here for a meeting on Barrow support and I screwed up on the dates of the meeting. It actually started yesterday morning but I didn't catch that until yesterday morning. Anyway, this is the view of Anchorage from the hotel room window. Nothing too spectacular and since it is before sunrise, you can't see the mountains. Maybe I'll post another shot later. The is the view in the other direction that I had taken last night looking towards Cook Inlet. Again, the mountains on the other side of the inlet aren't visible. 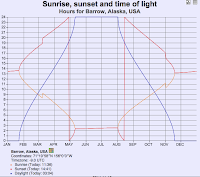 I head back to Fairbanks this evening so it really is going to be a short trip. Update Tuesday Afternoon - A shot from terminal C at the Anchorage airport. It is a pretty nice, sunny day with temperatures above freezing and blue skies. In addition, the meeting was useful and productive. Not at all moto-related though you may be interested if you use the Chrome browser and use Blogger to host your blog. On October 21, 2014, Google added support for tokens as an additional factor for authentication. Hopefully you already have two-factor authentication enabled which means that you need something you know and something you have to log into your account. Typically this has been a password (something you know) and your cell phone (something you have). The cell phone component is typically the Google Authenticator app which gives you a six digit code that you would type in on the web page to complete the login process. The "problem" is that the authenticator is time based and if the time on your phone is not synced properly, the code displayed would be wrong as they are only valid for about one minute. This has happened to me more than once such as whenever I am out of the country (including Canada). Google does provide a backup process involving text messages, phone calls or pre-printed lists of one-time use codes. The device pictured is the FIDO compliant U2F security key made by Yubico that I picked up on Amazon shortly after I saw the announcement. Now when logging into Google, after entering my password, I just insert the key into a USB port and tap the circle then remove the key. Pretty straight forward. The downside is that, at least for now, you have to be using the Chrome browser. U2F stands for Universal 2nd Factor and now that it has been adopted by Google it may speed up adoption. 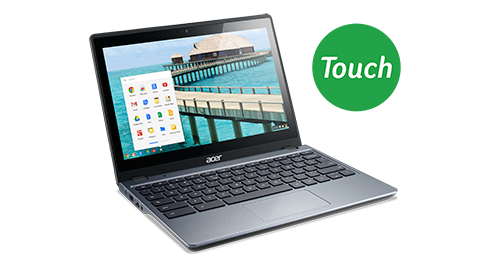 Using this device doesn't mean that I can disable the Google Authenticator as it is still needed for mobile applications (no USB on the phone) or other browsers. I also use Duo Security for second factor and they also support the security keys but I haven't had an opportunity to set it up.